Not all trade schools, universities, high schools, or elementary schools are the same. Not every classroom, lecture, or discussion is the same. Not every student is the same either. Every person, young or old, at any stage of their education, learns differently. Since everyone learns differently, it follows that a general guide consisting of general study tips will only take a learner so far before customization is necessary. 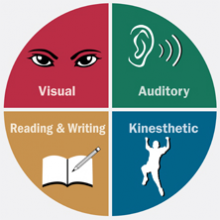 Instructors and students alike should understand how the various learning styles can best be applied, both for individuals and for others they may work with in the future. There are a few different learning styles, and no style is better or worse than the other, but there are proper ways to study based on which style you most identity with. 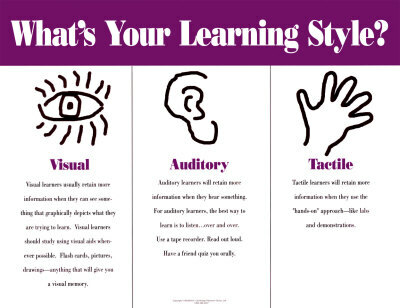 The three main types of learners are auditory learners, kinesthetic (hands-on) learners, and visual learners. From a young age, teachers and parents are able to tell what type of learner a child is and most likely will remain forever. With this in mind, teachers and parents can achieve maximum success in teaching something to a child. At a certain age, a child will understand what type of learner they are, and be able to adjust his or her study habits accordingly. Once study habits are obtained, they can be perfected over time, making learning easier with practice. Auditory learners are able to learn information the best when it is heard out loud. These learners will thrive if given oral instructions and can participate in class discussions. Reading assignments will be harder to learn from, and lectures will be most beneficial to this learner’s overall success. In a university scenario, taped lectures can be very useful for an auditory learner, because they can listen to it over and over again if necessary. A study partner to read writing aloud for will be best for finding mistakes in essays or other written work. While writing, it would prove helpful to read it aloud to yourself. Brainstorming can be done through recording and playing it back or in open class discussions. Being told directions, rather than reading them from a paper, email, or other written word form, will ensure that the task is done most efficiently. Kinesthetic, or hands-on learners, learn by doing. They will absorb information easily if taught in labs or through physical activity. Classes that include lots of reading or writing can be very difficult for these learners. Studying as a kinesthetic learner is perhaps the most labor intensive. This type of person is advised to use as many senses as possible given the situation and material to be learned. Scented markers, flash cards (sometimes even with holes or other abnormalities for texture) and chewing gum are highly recommended. Instead of writing a paper or completing a worksheet, a kinesthetic learner should ask to make a project. If this is not possible, objects or materials that can be easily manipulated can be used to learn, or even just the use of motion. Taking breaks is vital for this type of learner, especially if sessions involve sitting for long periods of time. Draw maps or diagrams on paper or within the mind to ensure that you will best remember them. Take sufficient notes during a lecture or presentation, the act of writing allows the information to be more easily accessed later. Visual learners will understand concepts that they are able to see. New tasks are best learned by watching someone else complete them. Lectures or presentations will typically be boring if they only involve speaking, and should include slides, overheads, or poster boards if a visual learner is expected to grasp the material. During a lecture or presentation, sufficient notes should be taken, and organized into outlines if possible. Abbreviations and symbols within notes are pleasing to visual learners. A shorthand developed by someone else that is fully understood, or a shorthand invented by yourself, can and should be used in note taking, but only after the material is read ahead of time. Slides and writing should be paid attention to and asking for a demonstration is always encouraged for a visual learner. Outlines, mind maps, diagrams and pictures are not only recommended, but also required. Color-coding these items will only increase success in learning for a visual learner. Other visual stimulation such as a television, computer, or room decorations in a study space should be removed or kept to a minimum. From a teaching standpoint, knowing what type of learners you are teaching will help ensure success on both ends. Understanding each student is key, and it starts with how they learn. The relationship between boss and employee works much of the same way. Coworkers can also benefit from full comprehension of this material in general and in relation to whom they work with. Studying can be frustrating task for those who do not know how to properly study for their personal style of learning. However, if you know how to study efficiently and effectively, it will make the job that must more bearable and rewarding in the end. Studying in a way that is tailored to your needs will make success all the more attainable for you. Whether it is an A on a paper, a passing grade in a class or information required to deliver a job-related presentation, study tips such as these are invaluable to any type of learner. Auditory, kinesthetic and visual learners all have one thing in common – the desire to learn. It is understanding what they do not have in common that is the secret to success.